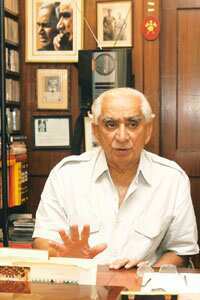 New Delhi: Former defence minister Jaswant Singh on Wednesday said he has resigned as chairman of the important Public Accounts Committee (PAC) of Parliament, stating that he has decided to quit having “proved his point". Singh, who was expelled by the Bharatiya Janata Party (BJP) on 19 August after he wrote a book on Muhammad Ali Jinnah, was asked by the BJP to quit the position as it belonged to the principal opposition “by convention". Lok Sabha Speaker Meira Kumar has accepted Singh’s resignation, said an official in the Speaker’s office who refused to be named. Singh said that he met Kumar on Monday and submitted his resignation and requested her to let him complete three pending PAC reports till 31 December. Singh’s tenure as PAC chairman was to end in March. BJP insiders said Singh could be replaced by party vice-president and Lok Sabha MP from Maharashtra Gopinath Munde, who along with Yashwant Sinha and Shanta Kumar, is the party’s representatives in PAC. Singh’s resignation has triggered speculation of a possible reconciliation with the BJP. However, when asked if he could consider returning to the BJP, Singh said, “I am not a person who uses a bait for entry and exit."